Ariana & Pete are lookin' mad cute. Just last week Ariana Grande was teasing Millie Bobbie Brown for posting a cute photo of she and her boo on Instagram and now Ariana's man is doing the same thing with her. The "No Tears Left To Cry" singer was already spotted with Pete Davidson last night at The Comedy Store in Los Angeles with her new rumoured boyfriend, but now the comedian has posted a photo of them together on his Instagram so we know it's real. 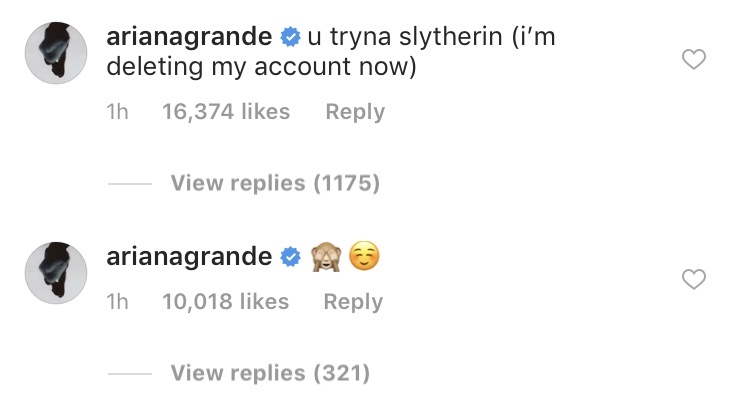 The photo sees both of them posing in Harry Potter apparel with a caption that reads "the chamber of secrets has been opened ..." What's even cuter is Ariana's comments on the new snap. "u tryna slytherin (i'm deleting my account now)" as well as, "🙈☺️." They've clearly acquired some inside jokes that they are okay to publically share, proving that they are indeed a new item. When the news first broke of the duo linking up, trolls went after Pete who previously revealed he has borderline personality disorder. "Just because someone has a mental illness does not mean they can't be happy and in a relationship. It also doesn't mean that person makes the relationship toxic," he said. "I just think it's fucked up to stigmatize people as crazy and say that they are unable to do stuff that anyone can do. It's not their fault and it's the wrong way for people to look at things."